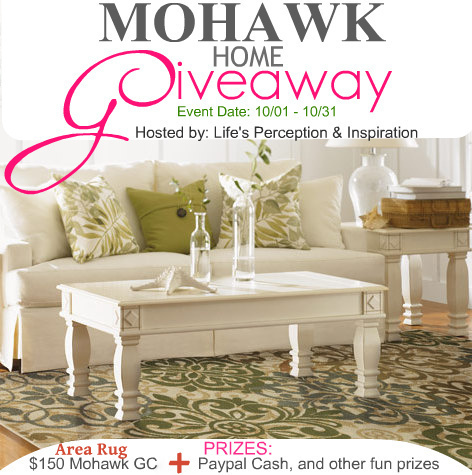 Life’s Perception & Inspiration is hosting a giveaway in cooperation with Mohawk Home and other Sponsors. thanks ,this is a good sign up for additional fb likes. Great prizes! I wish I have luck with contest, but sadly I don’t…:-( Good luck to the participants though! i would love to join, i will enter when i have time soon. i hope there’s still space for me! Thanks for sharing, hopefully I’d remember to sign up, later! I’m sure the winners will be thrilled with these prizes. Good luck in this contest! would love to join only that I don’t have the patience to fill up the forms, haha. Love piece of furniture that is and to be able to win it, oh will be as delightful. That is a cool giveaway coz it’s also open internationally. All the best! sounds like a good give away. thanks for sharing! good thing they have cash option as prizes for winners outside US. thanks for sharing!